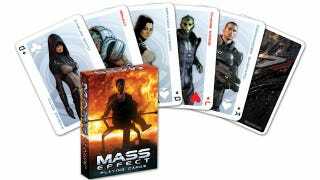 Dark Horse's merchandise wing have put together two welcome, if unexpected pieces of Mass Effect and Dragon Age merchandise: decks of playing cards. The decks feature character art from both series, and at the moment are going for the decidedly affordable price of $4. What I need to know before buying, though, is whether the Mass Effect deck actually uses Joker for the Joker cards. Because if not, uh, well. That would be madness. There are no images of the Dragon Age cards yet, but both will be available in mid-November.